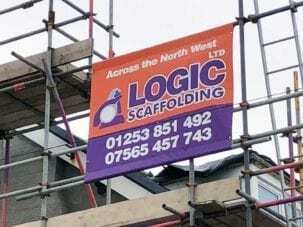 Banner World are experts in Scaffold Banners and Scaffolding Signs, with years of experience. Our Banners, Building Wraps and Signs are heavy duty, built-to-last, and fit-for-purpose. Scaffold Banners can be made to any size to suit your requirements, from small 1m x 1m banners right up to huge building wraps. 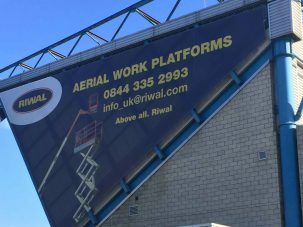 Banner World are experts in high quality Scaffold Banners and Scaffolding Signs, with years of experience. Our Banners, Building Wraps and Signs are heavy duty, built-to-last, and fit-for-purpose – without the extra cost. We use only the best materials, including our flame-retardant rip-stop PVC banner and quality windproof meash banner. Banners are finished with heavy-duty hems, metal eyelets and tough welded pockets as standard. Our high production and finishing specifications are crucial to the lifespan of a scaffold banner, we have seen many from other suppliers fade within weeks or simply rip themselves from fixings in high winds. Our very low prices are based on the high volume of Scaffold Banners and Scaffolding Signs we produce every week, plus our efficiency of design and manufacture. You can place an order for just one Banner or Sign, or for hundreds. Our Standard PVC Scaffold Banners are made from our tried and tested 500gsm Rip-Stop PVC which can be printed single sided in full colour. The extra strength in this material reduces the stress caused by weather conditions up on scaffolding. This makes it last longer and look better for longer than cheaper materials used by other suppliers. Premium Scaffolding Banners are made from our almost indestructible 650gsm Blockout PVC which can be printed on both sides and used for double sided banners. Larger Scaffolding Banners are recommended to be made with one of our Mesh PVC materials. Tiny holes in this material allow wind to pass through and reduce wind-load on scaffolding structures. Standard Mesh has a 70/30 print surface to hole ratio, whilst our AirMesh PVC has a more open weave to allow even more air to pass through. Mesh also has the advantage of letting light through into the building behind. All our scaffold banner materials are flame retardant, waterproof and weather resistant. We print using fade-proof inks to ensure your banners remain vibrant and visible even in exposed locations. Please contact us if you have any special requirements for your scaffold banners such as odd shapes or specific finishing instructions, we’re always glad to help. Typical Scaffold Banners can be finished with any combination of welded/stitched hems, secure metal eyelets and pole pockets – included in the price. We can advise on the best finishing options for your scaffold banners, based on their dimensions and location. Larger scaffold banners benefit from omega tunnels which are fitted to the reverse of the banner. These allow the banner to be fixed to vertical scaffold poles at regular spacing. Smaller Scaffold Banners can be specified with sleeve pockets top and bottom through which you can slide scaffold poles. Adjusting the gap between the poles allows you to tension the banner and prevent it from flapping around and being damaged. Larger scaffold banners are best finished with hems and eyelets, allowing you to fix them to an oversized scaffold frame using bungee cord or shock cord. Shock cord should be threaded through the eyelets in short sections and tied off. Avoid using cable ties or standard rope as these do not offer any give during wind gusts. Giant Scaffold Banners can also be finished with omega tunnels or sleeve pockets on the back. These allow the fixing of the banner at regular intervals onto long vertical scaffold poles. Please ensure your artwork is print-ready and conforms with our requirements here. Our staff will always check your artwork files and contact you immediately with any queries prior to printing. You can design your banner at actual size or to scale, depending on the software you use. Ensure that your final print file will scale up in proportion to the size of banner you have ordered. Ensure that no critical information is within 100mm of the edge of your banner design, this allows room for eyelets, hems and other finishing options. Background images and graphics are fine, just be wary of text, numbers and logos. Set your artwork to CMYK, as this matches the print process. If your artwork is in RGB mode, the colours may not come out as expected. Colour matching to Pantone references is possible, but may take longer and will incur an extra charge. Files including pantone colours will be converted to CMYK unless you specify a colour match in your order. Banners are first and foremost an advertising medium. Information displayed should be clear to read – consider how far away your target audience will be. If your banner is intended to be viewed from a distance then the contrast should be high and typefaces need to be legible. If you try to cram too much information onto a banner then the text may end up too small to read! Our standard PVC banner material is our heavy duty 500gsm Premium banner. This is a rip-stop PVC and exceptionally strong. Ideal for single-sided smaller scaffolding banners. Larger Scaffold Banners need to be printed on Mesh material or fabric to reduce wind-loading on the structure. Finished with heavy duty hems and eyelets or pole pockets. Designed for double-sided Scaffold banners this material features a black liner which prevents the opposite side showing through. Exceptionally strong, finished with pole pockets and/or eyelets. Suitable for larger areas, AirMesh Flag is a very lightweight but strong polyester fabric with mesh holes to reduce wind loading. Smaller Scaffold Banners can be easily fitted by sliding scaffold poles through pockets top and bottom, or by bungee or shock cord to eyelets. 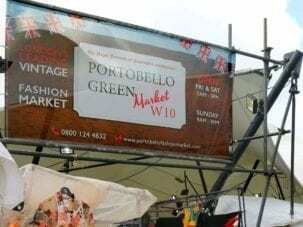 Larger Banners and Building Wraps need to be carefully fitted, usually by constructing a frame from scaffolding then using bungee or shock cord though eyelets to secure. This tensions the banner and allows some give if the wind gusts. 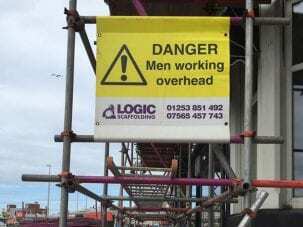 Will my Scaffold Banners last? Thanks to our quality material and ink specification, along with our superb quality of finishing – your scaffold banners will last longer than those from other suppliers, provided they are installed correctly. Email us at sales@bannerworld.co.uk and one of our designers will contact you for a design brief. Can I upload multiple images for a quantity of banners? Yes, you can use as many different images as you like, one for each separate banner if required. Can you colour match to our specific branding guidelines? Yes we can, please contact us for details. Can you provide samples of your materials? Yes we can, go to our Print Samples Ordering page.